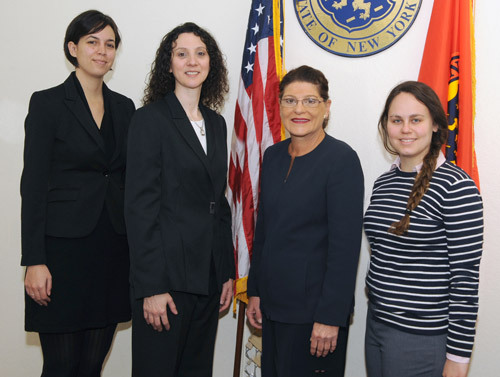 Mineola, NY) Nassau County Clerk Maureen O’Connell recently hosted law school graduates from Hofstra University that are part of a new legal fellowship program called the “Hofstra Law Access to Justice Incubator.” The “Incubator” is a separate non-profit corporation affiliated with Hofstra Law School. The purpose of the program is to provide pro bono and low-bono civil legal services for residents of Nassau County in need. Clerk O’Connell was happy to give Lisa Petrocelli, the head of the program and two of her fellowship students, a tutorial concerning the functions of her office. The County Clerk is Chief Clerk of Nassau’s Supreme and County Courts, processing documents related to civil proceedings and registering all real property records in the County..